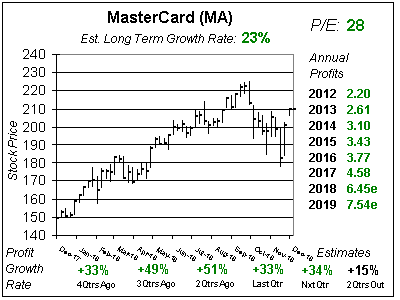 MasterCard (MA) has been riding higher since 2011. MA stock has pretty-much gone up without a big correction since the beginning of 2011, rising from $22 to $123 during that time. That’s quite impressive, especially since profit growth hasn’t hit 20% since 2011. MA stock is a hidden gem for successful mutual funds. Managers know they can buy big lots of stock and get steady returns in a big, safe stock. MasterCard consistently grows revenue each qtr, and that has helped profits increase every year since the stock went public (2006). International card adaptation gives the company growth opportunity, and technological advances with advanced payment types help spur growth. One new initiative is MasterCard’s Cash Passport, which is a multicurrency prepaid card that lets travelers load up to 7 currencies at a time. 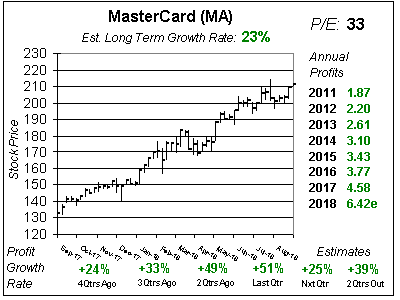 MasterCard has a good Estimated Long-Term Growth Rate of 15% per year. Management pays a dividend of 1% and bought back $1 billion in stock just last qtr. For the last couple of years the strong dollar ate into profits. Now with the dollar down, growth could accelerate to 15% or more this year. Overall this is a core holding for conservative investors, but the high P/E of 29 for a 15% grower makes the stock a tad pricey. MA is in my Conservative Portfolio and have it on the radar for the Growth Portfolio. MA gives up-front incentives to banks to garner new business and this hurts profits in the beginning of the deal while helping profits further out. This makes profit growth lumpy. Last qtr MA had sales growth of 12% which was up nicely from the 9% the qtr earlier. Profits grew 17%, much better than estimates of 9%. But estimates for the next 2 qtrs got lowered a bit. Overall, 2017 profit estimates ticked up to $4.31 from $4.26 last qtr. Qtrly profits are Estimated to climb 8%, 10%, 22% and 13% the next 4 qtrs. That’s good, but the P/E is 29, which is a little high. MasterCard has had a median P/E of 25 or 26 in each of the last four years. And now with profits expected to grow a pedestrian 14% this year, I don’t feel like taking my Fair Value higher than 26. Thus, MA is slightly overvalued in my eyes. MasterCard has been a solid winner for more than a decade. Money managers know this, and have pushed the shares so high they are a bit overvalued. I love this company, and like the stock. MA has Est. LTG of 15% a year, a 1% yield, a stock buyback program and high certainty as the company has grown profits in the double digits every year since it went public. MA ranks 12th of 33 stocks in the Conservative Growth Portfolio Power Rankings. I have it on the radar for the Growth Portfolio and will look to buy in if it corrects to $100.